NB: This page is only a review of these headsets, I am not a supplier for beyerdynamic (my business is video production, not equipment sales). If you want to buy headsets, or	replacement parts, I recommend Showcomms (in England). They've given me very good service in the past, even being able to get spare parts that weren't already listed on their website. 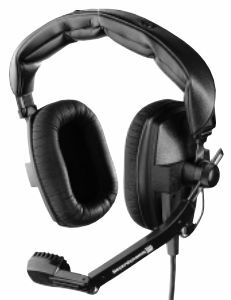 A set of beyerdynamic headphones is virtually a staple in the professional video production industry, particularly for camera crew intercom systems. (The uncapitalised brand name is on purpose, that's how they write it, themselves.) They've been around for donkey's years, the beyerdynamic company, and their headphones that any studio has in their inventory—they last that long that you will find studios with twenty-year-old headphones still in use. That's probably the main reason they're so prevalent—they're very robust, and you can buy replacement parts for the bits you do manage to break (though you might have to hunt around a bit to find a supplier, and some only carry the most commonly replaced parts). They also muffle fairly well (20 dBA passive reduction of ambient noise), and are more comfortable to wear than the hearing-guard type of headsets as used on race tracks (they have to grip very tightly, and your head gets hot when your ears are sealed in), though they won't muffle as much as hearing guard sets (30 dBA, and more). However, both the headphones and the parts are quite pricey. That's somewhat understandable when you consider that they're built quite well, but not so understandable when you consider that they've built the same parts for around thirty years, nor when you consider that their sound quality is not that good (good but not that good, considering the price). As with some other products, they've developed a reputation, perhaps more than they deserve, and that's inflated the price. Quite a lot in some places—I can find prices ranging from $200–$550 for the same models. Interestingly, one of the newer models, the DT 290, can be a bit cheaper (the parts and complete new sets), and have better technical specifications, but are made with more plastic parts (that are less robust, as far as I'm concerned). They're quite versatile, with a variety of models for many different purposes. There's single-ear (DT 102) and both-ear headphones (DT 100). Headsets with a microphone attached, again with single-ear (DT 108) and dual-ear (DT 109) options. Versions in a variety of different impedances. And slightly different models with better specifications; such at the DT 190 with a wider frequency response, and a balanced audio microphone; as well as even more different models, such as the DT 290, with options for different microphones (dynamic, electret, pre-amplified). I like the DT 109 for being robust and useful in fairly noisy environments, but if I wanted to use headphones in a quiet space, I would pick better sounding and more comfortable ones to wear, such as the DT 290; though they're less robust and less muffling, with only 16 dBA attenuation (the DT 250, 280, & 290 series have a different physical design than the 100 series). Generally, this review is about the DT 109, but occasionally the DT 290 (mostly as a comparison). We use the DT 109s for camera intercom, a DT 290 for the audio operator (who has combined audio monitoring and intercom). And DT 100s for intercom monitoring without talkback, and for field audio monitoring where equalisation will be sorted out in post production, or by someone else. The earmuffs that fully surround the ear (circumaural) with large pads, and the closed-in back of the ear pieces, mean that they do isolate you from the outside world quite significantly, and that's important for the video production work that we do. We need to be able to hear the sound from the headphones, against any surrounding ambient racket, and without having to run the volume level too high to manage it. We, also, don't want the talkback to be heard outside of the headphones when you're recording something that's quiet. Lightweight, unmuffled, headphones are useless to us. They have a large metal headband, it's covered and well padded, but it's strong metal. It's not going to easily break, and you probably could successfully unbend a mangled headband. They're probably not best suited to anybody with a small head, they seem to be developed for very large heads, it's surprising how far apart you can move the earpieces from each other and the top of the headband, though this does make it easier to wear the headphones over a hat. Unfortunately, the earpieces do slide down the rail a bit too easily, so a bit of accumulated grime actually helps keep things in place. On the headset that I wear, I've fastened some cable-ties around the bottom of the headband, essentially raising the end-stops, so that the earpieces can't slide any further down. It's a semi-permanent approach—it'll last until I deliberately remove them, simply by cutting them off, and avoids the mess created by gaffer tape (the television industry's usual all-purpose fix-it). The earpieces and padding are quite big, not fiddly nor fragile. The microphone boom arm's fairly robust. Not damn fool proof, but should last a very long time with reasonable care. The wiring is quite tough, including the short cables that attach the various bits together, electrically. And the interconnect cables don't stick out as much as they do on some of our other (Sennheiser) headsets, which get snagged on other things. It's all easily replaceable without requiring specialist tiny wire, though you can buy proper replacement cables as a spare part. The main cable attaches to one side only, and has a plug and socket at the headphone side for easy replacement; whether that be replacing a broken cable, or switching a cable for one with different connectors at the other end. There's quite an improvement in reliability by swapping the entire cable to avoid using plug-on adaptors, but quite an increase in cost, too. Just a simple cable with the 6- or 7-pin beyerdynamic headset connector on one end, and bare wires on the other, costs more than some headphones do. The earphones can take quite a bit of a bruising, power-wise. By all reports, you could get away with powering them to levels well in excess of what would be good for your ears. Not that you should do that, but it means the headphones are far less likely to be destroyed by accidents with volume levels. And, no, having headphones that self-sacrificed wouldn't be enough to protect your ears from hearing damage. The have a sort of hollow sound effect to them, one that many enclosed headphones have—a midrange resonance that's not very pleasant, like when you cup your hand around your ear, or put a speaker into a small cavity, and the sort of thing that leads to listening fatigue. It's not too extreme, nothing like as bad as I've heard in other enclosed headphones, but I wouldn't call them Hi-Fi. They're really designed for speech, not music. And whilst the specifications claim 30–20 kHz frequency response, they sound very lacking in bass (like woofers that have torn free from the roll surround, or aren't mounted on a baffle). I'm someone who usually runs with no tone controls on headphones and speakers, so I don't expect boomy bass, but I do expect to hear low pitched notes well. So I suspect the measured response either is taken much further down than the traditional −3 dB points (their response graph for the microphone certainly seems that way, so I wouldn't be surprised if their headphones are similarly over-enthusiastically rated), or has some rather large dips in it (most speakers do). Manufacturers' claims about headphone frequency responses have always been over-boastful (including any audible frequency as part of the response, even if the level was dramatically different from the average, or even barely audible), but I expected better from a company so famous for their headphones. They're quite fine for comms purposes, but you'd want something better for accurate recording monitoring. Some literature does admit that these headphones, like various other beyerdynamic headsets, are designed for voice clarity (i.e. being optimised for the frequencies covering speech, rather than flat high-fidelity frequency response). They have other models that are designed for music listening. But, interestingly, we have some very old DT 100s, which have the same headphone drivers as the DT 109s, and they sound better (bass- and midrange-wise) than our new DT 109. I'll have to see if, over time, their response changes after some “burn in.” Some people claim it exists, others don't, but now I have something to compare against, rather than my ears getting used to speakers that haven't really changed. Addendum: After some considerable burn in, time, I can't say that I notice any change. All the 100 series headphones and headsets that we have seem quite lacking in bass, though the older headphones seem a bit better than the newer headsets. I'm inclined to believe that the older headsets sound better thanks to differences in build, rather than improvement with age. At the other end of the frequency range, they sound very good, on a par with every other very good headphone that I've listened to, though I have to admit that my hearing isn't what it used to be at the high end of the spectrum, and I'm working with gear that has 15 kHz as its upper limit (Australian television and radio's broadcast specification), so I won't try to give them a golden ears assessment, and I don't have the gear to do a technical assessment of headphone audio response. I've come across several headsets where the signal and shield wiring has been wired backwards across the headband. The phasing's fine, as they've made the same mistake on both sides, so you wouldn't notice a problem under most circumstances. But on headsets with microphone wiring, you want headphone wiring to have the shielding wired correctly, on everything, to avoid signal crosstalk between microphone and earphone wiring. Apart from being able to cause nasty noises, high gain circuitry that starts to oscillate supersonically can fry itself, or induce problems in surrounding equipment. The older sets used to come with a fairly hard vinyl earpad covering, which wasn't all that comfortable, and not much of an air seal. That meant they didn't muffle as well, but your head didn't roast so much, and the earpad coverings were fairly tough. Later on, they came with leatherette (aka pleather), which was softer, more comfy, sealed better, which muffled better against outside noise, but your head heats up more (normally, your ears radiate some heat away from your head, but can't do that when they're sealed in), and leatherette is easily torn by anything that snags it (it also tends to breakdown, over time, and you end up with the outer layer peeling off). Now, it seems that the default earpad is a soft PVC, which sits somewhere between the two prior types of earpad covering for comfort and muffling ability (the specs say 20 dBA ambient noise attenuation for the headphones, overall, but don't mention with which earpad type). As well as less head roasting, I'd say that they'd have greater durability (I can't imagine these cracking like the harder vinyl earpads have on our oldest headsets). The cotton jersey, alternative, earpads are more comfy, seem to attenuate noise as well as the default vinyl ones, and you can wear the headsets for much longer than the vinyl or pleather ones without roasting your ears, but I suspect they're probably more likely to snag and tear on something if not looked after, whereas the vinyl ones are more likely to just skid over things, unscathed. Fabric pads are going to absorb sweat, too. That's probably fine for personal headsets, but less so for ones that'll be worn by different people. The earpads are available as spare parts, but are rather pricey. Too pricey to change them willy-nilly ($20 or more, depending on your currency). And they're going to break apart, in a short time, if you were to buy just a few different pads for different people, and keep swapping them around (they're a very firm fit, that requires careful stretching to fit them over the earcups). What's needed is something more like what's used with some aeronautics headsets—cheap, and quickly replaceable, hygiene covers that slip over the top of the cushioned earpads (they're like a thin sock, with the right shape to fit the earpads). Because they're cheap—just a few dollars a pair—you can dispose of them without wasting too much money, or you could wash and re-use them. The spare parts lists offer alternative earpads, such as velour (it was mentioned by name, but no part number), plush (EDT 100 P, or part 445.576), and cotton jersey (EDT 100 T, or part 445.584, or part 945584), but I've only found one supplier actually offering anything other than the soft PVC type (EDT 100 S, or part 407.003). The DT 100, 102, 108, 109, 150, & 190, headsets, all use the same size earpad (albeit with some different part number codes), so that widens the ordering possibilities. The DT 250 (sans-mike), and DT 280 and 290 (with mike) series have different dimensions from the 100 series, though the 200 series headsets are the same as each other. I've used DT-109s with hard vinyl, soft PVC, and cotton jersey earpads, and DT-290s with plush earpads. And I've just listed them, in that sentence, from the least comfortable to the most comfortable types of earpads. If you're wearing headsets for prolonged periods, especially in the extremes of hot or cold weather, comfort is important. The DT 108 and DT 109 have unbalanced microphones, the DT 190 has a balanced microphone, all are hypercardoid dynamic mikes, designed for close miking to the speaker. Generally, I find dynamic mikes better for headsets, they don't need power, and feeding power up a mike lead can cause all sorts of nasty noises when connections rattle, not to mention it's easy to destroy a dynamic microphone when phantom power is applied to unbalanced lines. Though dynamic microphones can pick up more noise from being close to other equipment (such as camera viewfinders) than electret microphones will pick up. And the DT 109s do pick up hums from power transformers, and video monitors, all too well, unfortunately; whereas our DT 290 headset is much more immune (seems to be due to the microphone design, more than the balanced wiring, as it still has less EMI pick-up when one side of the mike audio is unbalanced by grounding it). I wouldn't exactly describe their quality as “broadcast specification,” despite beyerdynamic's claims, as it only covers 40–12,000 Hz, whereas 30–15 kHz was the old broadcast specification for analogue television and FM radio, and I expect something even better, nowadays. But the mike is really aimed for voice use, not recording instruments; and for speech, not singing operas into it. So I'll cut it some slack in the frequency range it covers, though I'll note that while the DT 190 headset specifications lists 40–12,000 Hz, the frequency response graph shows it to be more like 100–10,000 Hz. A bigger problem is that it has rather poor isolation from noises transmitted mechanically along the boom arm (such as clonking the boom, or any other part of the headset, even the main cable). The mike is hard mounted in the boom, it has no shock mount, and can makes quite loud and awful noises if the boom is clonked into something (it doesn't just make a quick clonk, it rings a bit), and picks up any creaks and rattles, from the rest of the headset, if you move about a bit. We've some HMD 224 and HMD 414 Sennheiser headsets that minimise this problem, quite a bit, by having the microphone mounted on a rubber section, at the end of the boom arm, and having a lighter-weight main cable. The microphone is barely affected by light wind. We've noticed no wind noises coming through the microphone, in a light breeze, where our Sennheiser headsets were distorting badly. We haven't used them in strong wind, yet, but it'd be fairly easy to wrap a foam windguard around the microphone. And, like the earpads, the small foam windguard that's part of the microphone assembly can be easily replaced. A useful feature that other headsets have, and these don't, is muting the microphone when the boom arm is pushed up above your head. Also, while discussing the boom, other headsets allow you to place the microphone on the left or right side simply by swinging the boom over the top, or underneath, to the other side, then wearing the headset the other way around. But these headsets require disassembly of the boom mechanism, to switch sides, as the boom only swings through 180° (all the way up, to all the way down, on one side). You could assemble them so the boom swung underneath from one side to the other, but then you couldn't push the boom up out of the way if you needed to, such as when you want to talk to someone near you without avoid annoying other people over the intercom, and when packing the headsets for transport. You couldn't re-assemble it so the boom went over the top from one side to the other, as it wouldn't go down far enough to use. And with any headset, if you switch sides, you turn the headsets around and wear them the other way, making the left earpiece now the right earpiece, and vice versa, so you need to be able to change the signals going to each ear if you use stereo audio. That means rewiring a plug, or having switchable headphone amplifiers. The product brochure proclaims the mike is noise-cancelling, but I don't agree, they pick up plenty of ambient sound. Other product descriptions list the microphone as hypercardoid, and I'm dubious about this claim, as well. I'd call it cardoid, at best (most sensitive front-most), but you can certainly put the headset down, and hear everything said around it quite clearly. True noise-cancelling microphones should be almost silent if not spoken directly into them, with background noise being significantly rejected. They're quite good for general intercom use, though would be better with real noise-cancelling mikes, and I'd prefer to use something else to record someone speaking, i.e. it's not the best headset to use for narration. About the only advantage to doing narration through a headset, such as sports recording, is that the microphone is always in a fixed position relative to the speaker's mouth, no matter what they do. Speakers turning away from a table mounted microphone, as they are apt to do, or not holding a hand held microphone steady, can change the sound of their speech quite a lot. These headsets are typically used for professional intercom systems, and rely mostly on the speaker having the microphone about an inch from their lips, so their voice is generally much louder than the ambient noise. But having half a dozen crew dotted around a concert with their mikes open, very easily puts a fair amount of racket onto the intercom circuit. Having a good noise cancelling microphone avoids this problem, and doesn't force users into having to use push-to-talk (PTT) buttons for their microphones (so they're muted the rest of the time). It's not always practical to use PTT, as the crew may need to keep their hands on other controls, all of the time, and need to be able to instantly respond to the intercom. Noise cancelling really needs to be done in the microphone (it's physically designed to reject ambient noise), rather than try and do it externally with muting/squelch circuitry. It's horrible trying to produce a show, when you hear threshold-triggered muting circuitry continually false-triggering, giving you repeated bursts of loud ambient noise; and the opposite problem, where it cuts off the first part of what someone says because it doesn't un-mute quick enough. The headphones usually come with a 6.5 mm TRS plug terminated cable, but headsets (those with a microphone) tend not to come with any cable. As there's a wide variety of wiring options in use for intercoms, it's common to order a headset and a specific sort of cable for your needs. Whether that be one with bare wires, phone plugs, XLR plugs, and combinations of different plugs. All the pre-made cables I've seen have been rather tough affairs, rather like the microphone cable used with 3-pin XLR connectors (a similar width and weight, and with most of the cable width being thick insulation around the wiring). And whilst that's good for reliability, it makes it heavy, and the cable readily transmits noises, mechanically, along itself (clonks to the cable, and rubbing noises as it drags across things). Used on headsets with no microphone (e.g. DT 100, DT 102), or an unbalanced microphone (e.g. DT 108, DT 109). This is the connector on the earcup, itself. Single-ear headsets may wire the speaker across pins 1 and 4. I'd be cautious about trusting wiring colours, as someone may have modified the other end of a cable that you're working on, and I've seen pink instead of orange wiring. Don't use anything other than the green and yellow coloured wires for microphone wiring, as the shield wire only surrounds the green and yellow wires. Again, visually inspect the wiring at both ends of the cable, rather than just go by these colours; and you should test connections with a meter when customising cables, don't presume that the other end of the cable is wired in a predetermined manner. Microphone and earphone wiring crosstalk could be reduced by replacing the cabling with a flex that has more space between the microphone and earphone wiring (such as figure-eight styled cabling), and/or using shielded cabling on the earphone side as well as the microphone. Despite the wiring diagrams provided in beyerdynamic's literature, I'm yet to find any headset cabling that uses shielded wires for the earphones. They used ordinary insulated wire, Litz wire, or those (virtually unsolderable) foil conductors spiralled around a nylon core, but none of them were shielded. Used with headsets with a balanced microphone (e.g. DT 190, DT 290). This is the connector on the earcup, itself. Single-ear headsets may wire the speaker across pins 3 and 4. The connector is like the 6-pin one, above, except its additional pin 7 (the balanced microphone negative phase signal) is situated between pins 2, 4, 5 & 6, and being closer to pins 5 & 6 than pins 2 & 4. The above 6-pin plug cannot fit into a 7-pin socket, all the pins are spaced apart differently (at least this is true for DT 109 6-pin and DT 290 7-pin connectors, I haven't checked against the DT 190 7-pin connectors; though the two 7-pin connectors ought to be the same dimensions, according to a cable parts ordering list). Commonly used with headsets that plug the microphone into a normal microphone socket, and the headphones into a normal headphone socket, separately from each other. The headset cable will end in an XLR with a TRS on a short flylead. This option is very flexible, using standard connectors means you can connect to almost any equipment. The same as the normal way to wire a balanced microphone to an XLR connector. And the headphone connector will be wired the same way as ordinary stereo headphones (tip = left, ring = right, sleeve = common). Commonly used on many stage talkback systems, particularly belt packs (“Clearcom,” etc.). The pre-wired K109.28 cable that came with one of our headsets uses this wiring (6-pin beyerdynamic headset plug to 4-pin female XLR), as does the K190.28 cable (7-pin headset plug to 4-pin XLR). Most 4-pin XLR headset cables have a female connector on the headset, and a male connector on the intercom. This has the fortunate advantage, in the video production scene, of making it impossible to plug a headset into a 12 volt power supply outlet using a 4-pin female XLR connector (a very common arrangement). Accidentally plugging a headset into a camera's 4-pin male XLR power inlet won't do anything, there's no power on an inlet socket. We received one headset with a male 4-pin XLR with the microphone wiring crossed over (pins 1 and 2 the other way around), but that flies in the face of just about all XLR wiring using pin 1 for ground (pin 1 connects first, as the pin's socket is closer to the front of the connector than the other pin's sockets), and I suspect it was a badly wired home-brew connection. I've seen other headsets wired with pins 3 and 4 switched around (K109.42 cable), and that probably doesn't matter for a lot of cases, but it probably is best to keep the ground on the shielded wiring, even for the speaker wiring, to avoid crosstalk between speaker and microphone wiring. I've had headsets start to oscillate, electrically, on intercoms with high-gain amplifiers. Acoustic feedback is a different kettle of fish, and sometimes reversing the polarity of the earphone signal reduces that problem, but it really should be done without swapping the wiring shielding around (such as an electrical invert switch on the intercom pack). Commonly used on various talkback systems with two channels (theatre systems, some Sony and Philips television cameras, etc. ), where you may want to listen to different comms channels on separate sides of the headphones; or comms on one side, and program audio on the other. The pre-made K109.38 beyerdynamic cable is almost like this (it has left and right swapped around), and the K190.39 cable is exactly like this. An alternative wiring scheme for balanced microphone and two-channel headsets, as used in the K190.41 cable. Going against XLR audio wiring conventions, it's not using pin 1 for the ground. Coupling ear common and microphone shielding can be a problem, in itself, and should only done with audio circuitry that can cope with it. And, yet another, alternative wiring scheme for balanced microphone monophonic headsets (some secondhand headsets we got from a television or radio studio were wired this way). I've no idea if this pinout is a standard arrangement, or if it's just to suit some particular equipment. If the headset has two earphones, they're (usually) both wired in parallel, but low impedance headsets might have them wired in series. All the 5-pin XLR headset connectors, that I've seen, use a male on the headset, and a female on the intercom. Theatre lighting DMX cabling, also, uses 5-pin XLR connectors, but has male connectors on the dimmer control inputs. Lighting cables should not be used as headphone extension cables, they're wired differently. And extending headset cabling, in any way, is prone to causing intercom instability. If longer wiring is needed, it's better to extend the wiring between the intercom station and the rest of the intercoms. As used on one of our intercom stations. All the signals are balanced, and isolated from each other. 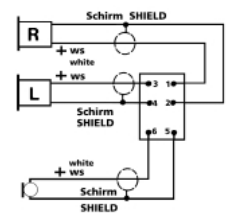 The shield does not connect to any signal line, it is merely wrapped around the microphone lines. For connecting signals with any equipment that's unbalanced, we ground the negative side. 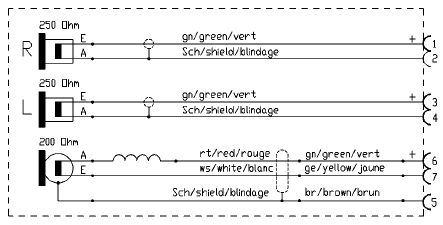 Another wiring scheme, as found on some Hitachi broadcast cameras and CCUs (e.g. SK-F300 and CU-F300). The descriptions are vaguer, for this one, than the others, as I was only able to probe the XLR pins of a single-ear headset, without access to the connector at the headset end of the cable. It had bridged pins 3 and 4, and pins 2 and 5, so the single-ear headset would work on equipment that could drive headsets with both earpieces, separately, and be able to hear both audio signals. It presumes that such equipment wouldn't mind having audio amplifier outputs being directly linked together—our intercom equipment is designed to cope with this being done to it. I have no idea which earpiece was designated to be left or right. And I am unsure of the polarity of any of the signals, though judging by the bridged earpiece wiring, pins 3 and 4 are the same polarity as each other, and pins 2 and 5 are same as each other. And, I am presuming that the microphone signal is balanced. If I get the chance, I'll probe the connections at the camera, some other time. For all the various XLR headset connectors, the XLR shells are generally not connected to any wiring in the headset plug, the shell will be grounded by whatever you plug them into. Connecting the shell to the headphone wiring could actually create noise, and the shell can't be relied upon as a signal conductor (some sockets make bad connections, some sockets are made from non-conductive plastic, and some connectors don't have lugs for connecting wiring to the shell). If you need spare parts, I'd happily recommend trying Showcomms. I've found them very helpful, and their pricing was good. I'd made enquiries with some other people, more local to me, but the local pricing was ridiculously high. While normally quite expensive, if you can find a pair without an inflated price, I think they're worth it. Eventually you'll amortise the cost, but it's a painful up-front cost if you have to buy a number of headsets. Although, thanks to how they're built, you've got a very good chance of finding secondhand headsets still in good condition, if you can find someone who doesn't need them anymore. You won't regret buying a headset that will last umpteen years, and is built for comms work. Most alternative headsets easily break, fall off your head when you look up or down, don't muffle the headphones enough, have over-sensitive omni-directional microphones, have microphones requiring DC power applied on top of the signal wire (which can make horrible crunching noises when connections are	not perfect), don't have frequency responses optimised for clarity of speech, are priced ridiculously expensive, etc. But for audio assessment, or just HiFi listening, you'd want one of the other models (than the 100 series). For example, music sounds very nice on the DT 290 headset, at low and high volumes. Written by Tim Seifert on 2 May 2009, and last updated on 26 Oct 2015.